Welcome back Kristina! Ms. Francillon, no stranger to The Genuine Kitchen and @MGFD_MIA where she is responsible for the weekly Sunday Brunch bell, joins us this summer as Brand Coordinator. Whilst juggling her role at HQ as a Michael’s Genuine Food & Drink reservationist, she’ll be supporting marketing efforts across all The Genuine Hospitality Group restaurants. You can follow Kristina on her blog at tastingitlikeitis.wordpress.com or on Instagram @tastingitlikeitis. At The Genuine Hospitality Group, using local and seasonably-sourced ingredients is as much a part of company culture as it is our kitchens. So it really hit home when we caught wind of the recent publication (June 26, 2014) of “American Catch: The Fight for our Local Seafood” by James Beard Award-winning author Paul Greenberg, especially the wave of mainstream headlines that followed. Greenberg noted in a recent interview with Terry Gross on NPR’s Fresh Air that, according to Oceana, seafood may be mislabeled at all points of the supply chain including restaurants as often as 25 to 70 percent of the time for fish like red snapper, wild salmon, and Atlantic cod, disguising species that are less desirable, cheaper or more readily available. Shocking indeed to know our very own industry is one of the biggest offenders in this delicate ocean-to-table dynamic. In his novel, Greenberg also discusses how over 90% of the seafood consumed in America, is imported from Asia and is farmed, particularly shrimp, salmon, and tilapia. In light of this national discussion that has bubbled up, we thought it was a great opportunity to hear what our trusted expert on fishing local waters had to say about it all. George Figueroa of our purveyor Trigger Seafood is never one to hold back on making his opinions known nor shy from jumping behind the line to whip up Florida lobster ceviche as he did for Vice Munchies (see minute 9:18) — only part of why we love him! Through his lens, we focus today on the disadvantages of non-local seafood and ways we can continue to support the fishing industry off our own shores. Chef de cuisine Niven Patel’s Yellow Jack Crudo with Kumquats and Shaved Vegetables at Michael’s Genuine Food & Drink. Black Grouper, a local fish of summer that Roel Alcudia is creating magic with at The Cypress Room, here with black tapenade, fennel and endive with chiffonade sorrel to finish. Trigger Seafood is a fishing specialist in South Atlantic waters, which encompasses the Keys and South of US 1. George has supplied TGHG restaurants with local, wild caught seafood, since our inception and primarily offers us triggerfish, wreckfish, yellow jack, cobia, snappers, and more since Michael’s Genuine Food & Drink first opened in 2007. Kristina: George, thank you for taking a few minutes to speak with us. How long have you been a fisherman and what attracted you to the field? George: I have been involved in the local industry all of my life, due to my family. As far of making it a business, we have been here since 2004. Kristina: Paul Greenberg’s recent publication: “American Catch” has caused a buzz about the perils of importing seafood, rather than consuming local fish; what are some disadvantages in your opinion of imported and non-local seafood in general? George: As long as it is domestic, I usually feel pretty strongly about the fish. There is more quality control with an American product. Of course, the closer you are to the fish, the quality will be better. For example, Pompano Beach is within an hour drive and you have control of what is being fished; whereas, if you are buying a fish from Seattle, you may not be familiar with the fish or the fishery. The closer you are to your fish source, the greater the quality of that product. If you are buying a fish from another country, you are not sure of who packs it, how, or in what period of time; that is my greatest concern. Salmon is the most common fish consumed in the US and over 85 % of it is farmed. Some farms use non-natural food, a form of keratin in the fish’s feed, which gives it the false color. The orange that you see on a salmon is not natural, typically. 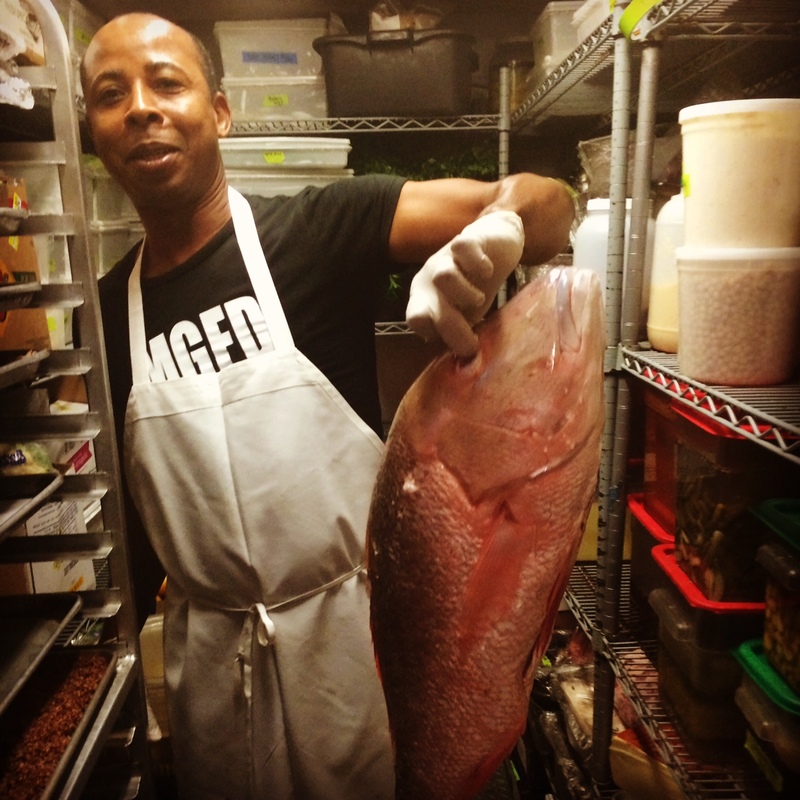 In the walk-in, Raul holding up a mutton snapper in the Michael’s Genuine walk-in cooler. Kristina: Wine producers are able to indicate a level of quality with the “AOC” label, for example. Does the fishing industry offer a similar method to control what we consume? George: NOAA (The National Oceanic and Atmospheric Administration) monitors everything that is caught in the United States. They monitor quota, sustainability, seasons and what is being caught. You have certain quality controls with NOAA. The key is to consume something domestic; once you leave the country, those rules can no longer be applied. Kristina: How can consumers educate themselves on the matter? George: In stores, it is difficult [to mislead the consumer] because stores have to label by FDA standards. But in the restaurant business it is a lot more private and they can get away with anything. They can mention local and it may not be. Unless the consumer does some research on the restaurant and finds out who the purveyors are, then they can be more sure. I offer restaurants the opportunity to put my name as a purveyor of local fish and label where it comes from, which helps the consumer. You can also visit websites for NOAA and FWC (The Florida Fish, Wildlife and Conservation Commission). With that information, you will know the expected size of a fish and you can check the season to know when a fish is available. In that way, you ensure that you get the variety that you asked for and that it is in fact, local. Kristina: What are some other benefits of consuming local seafood? George: Obviously, it helps our local industry and our sustainability, by buying the correct fish at the right season. You could choose not to elect an out of season fish, to avoid imported and commercialized [options]. 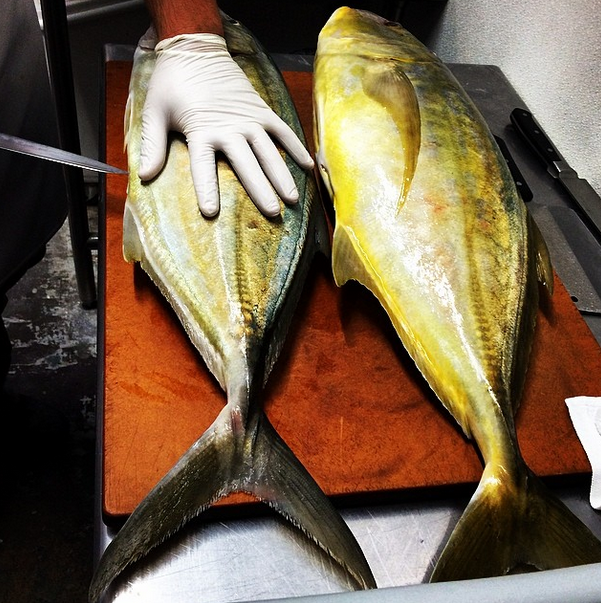 Tigger Seafood’s Yellowjack on the prep table at Harry’s Pizzeria, at the hands chef de cuisine Steven Martin. This particular fish may ultimately be served as a filet, but it’s always coming into the restaurant whole. Kristina: Cobia, grouper, mahi, and snapper are well known local fish in the Genuineland, but what are some other varieties that have a strong Florida presence? George: Wahoo is another option, wreckfish found in the Cape Canaveral area, American barrel fish, and pompano. If they go to the FWC and NOAA websites, consumers can review our local species to determine what is sustainable and available. Kristina: Our team is proud to feature your fresh fish at our restaurants and we thank you for your input on this debate. Do you have any additional points you would like to share? George: If they know whom they are buying from, they can be more educated on what they are getting. Obviously buying the local product, you will get a fresher fish. You want to keep your sources close. To learn more about local sourcing, visit our “sourcing” section on the blog and of course, stay tuned for further coverage. You may also visit the NOAA and FWC websites, which George mentioned, listed below for your convenience. Very informative study. As usual the MFHG is doing a wonderful job by letting the consumer know what we’re eating. Keep up the good work. Thank you again Kristina .